The U.S. Department of Agriculture’s National Institute of Food and Agriculture has awarded a grant of $4.7 million to Oregon State University to support its intervention program that keeps young people fit and healthy. The program has designed three classes, which aims to discover the best way for teens to develop healthy lifestyle skills and stay physically active. Class one focuses on practicing growing food, cooking healthily, preparing inexpensive meals at home, and staying active after high school sports end. Class two uses technology to create a real life environment in video games. In these video games, teens are encouraged to practice the same life skills taught in Class one. Class three is also technology-based. Instead of practicing healthy life skills in a real life environment, teens in Class three practice them in a fantasy world in video games in which anything is possible. About 500 teens, aged from 15 to 19, are separated and assigned into these three classes. Researchers at Oregon State University hope this program will help them find the best way to prevent teenage obesity instead of to reverse it. As Oregon’s leading public research institution, Oregon State University is dedicated to meeting challenges and solving problem through discoveries, innovation and application. The university has become one of the national top-tier research institutions in a range of fields including marine sciences, forestry, climate change, sustainable food systems, and public health. Oregon State University commercializes research through business partnerships and spin-off companies, and by licensing new technologies that turn ideas into reality. Last year Oregon State University generated $263 Million in research funding, which is more than all other public universities in Oregon combined. Of this funding, nearly $36 million came from private financial sources, which is a 65% increase in the past five years. Oregon State University was awarded 43 grants from the National Institutes of Health in 2013 amounting to $14 million, and received 11 grants amounting to $6 million in 2014. Each year, Biotechnology Calendar, Inc. hosts the BioResearch Product Faire™ Event at Oregon State University Corvallis campus. This year, the Oregon State BioResearch Product Faire™ Event will take place on September 10th 2014. The Oregon State BioResearch Product Faire™ Event will help laboratory supply companies efficiently connect to academic researchers at Oregon State University and create a productive relationship. 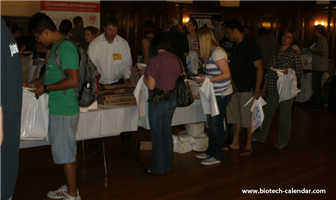 About 200 research professionals attended the Oregon State BioResearch Product Faire™ Event in 2013. In 2014, there are even more research projects at Oregon State University actively attracting research funding. Biotechnology Calendar, Inc. is expecting a higher attendance rate at this year's BioResearch Product Faire™ Event on September 10th. The event provides an opportunity for laboratory companies to demonstrate their products and services and help researchers at Oregon State find the best tools and equipments to develop their research projects. If you are a laboratory supply company, you are invited to participate in the BioResearch Product Faire™ Event at Oregon State University Corvallis campus on September 10th 2014. We are holding more events at different institutions across the nation. Please read: Show Schedule for 2014.